Thank you for your interest in the Congress. We apologize but registration has closed. 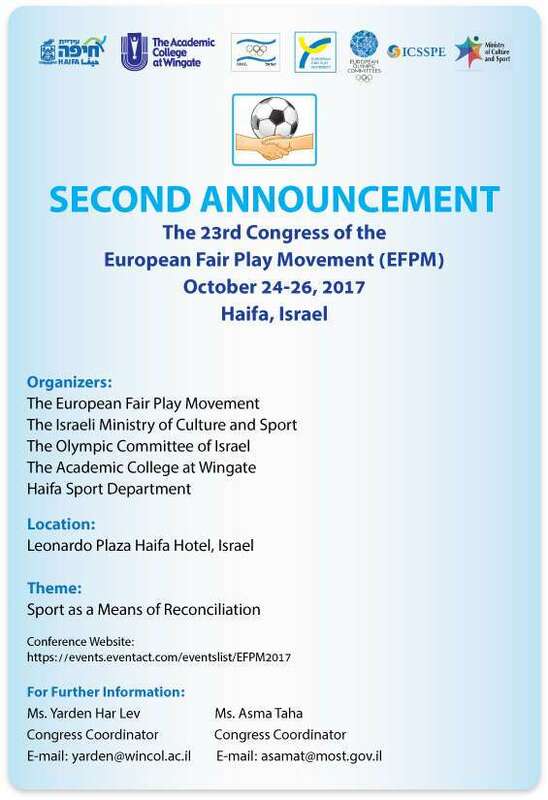 The European Fair Play Movement, The Olympic Committee of Israel, The Israeli Ministry of Culture and Sport, The Academic College at Wingate and Haifa Sport Department are proud to host the 23rd EFPM Congress scheduled to take place in Haifa, Israel. The European Fair Play Movement is a non-profit, non-political, autonomous body, independent of other national or international authorities, and represents the common interests of its members, being the fulfillment, development and promotion of the EFPM aims. The EFPM promotes and develops fair play in sport, education and everyday life, primarily in Europe. The EFPM reflects a philosophy of life, abiding by universal ethical values, seeking to create in the spirit of fair play and based on the educational value of good example through sport, a better world by pleasure found in sport with tolerance and respect for competitors. The aim of the 23rd EFPM Congress is to bring together leaders in the promotion of fair play from around the world to discuss, debate and promote the latest issues in fair play in sports for the purpose of achieveing and advancing the aims of the EFPM. Information on accommodations for EFPM Members can be found in the registration form. To avoid a no-show charge of one night room + VAT, a written cancellation should be received at the hotel no later than 14 days prior the day of arrival.